It’s never too late to add another recruit to the 2017-18 Boston University men’s hockey roster, which already has players such as Shane Bowers and Ty Amonte. This afternoon Jake Witkowski tweeted his commitment to Boston University and is eligible to play this coming season as per Elite Prospects. The forward played four seasons at Malden Catholic High before playing one year at Avon Old Farms School where he tallied 40 points (13g, 27a) in 27 games. Rising sophomore Patrick Harper, one of the leading goal-scorers during the 2016-17 season, was also a product of Avon Old Farms. Witkowski most recently played one season for the Alberni Valley Bulldogs in the BCHL. The 20-year-old played 58 games and amassed 40 points, however, found the back of the net 23 times. The Melrose, Mass. native looks to be a nice addition to the Terriers and will add more depth to the strong offense in the upcoming season. 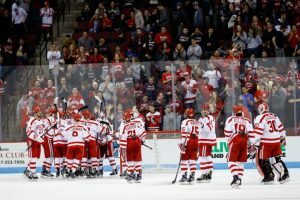 While the Hockey East Tournament nears for the Boston University men’s hockey team, that doesn’t mean the coaching staff has turned a blind eye to the recruiting trail. Rather, the Terriers, as first reported by SB Nation’s Jeff Cox, have secured the services of Liam Connors. The 2001-born winger plays at the St. Sebastian’s School in nearby Needham, Massachusetts. Aged 16, Connors, per his Elite Prospects page, has also previously skated for the Boston Jr. Bruins and Neponset Valley River Rats. While Connors won’t arrive on Commonwealth Avenue for several years, early word is he’s quite the talent. St. Seb's RW Liam Connors committed to BU over the weekend. Small, but crafty/quick, feet are always moving, top 8 uncommitted '01 in NE. Liam Connors '01 (St. Sebs) commitment to BU now public. Undersized forward with speed, skills, & smarts. As frosh in 29gp 15-13-28. 4 star prospect Liam Connors (St. Sebastain's) commits to BU. Smaller fwd w/ burst, high hockey IQ, quick shot & swift, elusive stick. Add another highly-touted player to the list of recruits for head coach David Quinn. Cade Webber, a 16-year-old defenseman, has pledged his NCAA career to the Boston University men’s hockey program, per Jeff Cox of SB Nation. '01 LD Cade Webber (Rivers) commits to BU. NTDP candidate is huge get for Terriers. Just about every Hockey East team + Penn St. wanted him. Re Webber to BU: 6'4" with NHL upside if he continues to develop at rate he has. First step, can close and has reach, skates with head up. While it remains to be seen when Webber would arrive on campus, he joins an already talented group of future blueliners. The contingent includes Case McCarthy, Kasper Kotkansalo, Cam Crotty and David Farrance. Webber, who currently plays for The Rivers School in Weston, Massachusetts, hails from Meadville, Pennsylvania. At Rivers, Webber plays for Shawn McEachern, the acclaimed forward who put up 186 points across his 120-game BU career. For further background, Webber’s family advisor is Pete Fish, the same person who worked closely with alum Jack Eichel and commit Jake Wise, among others. The commitments just keep on coming for the Boston University men’s hockey team, as Canadian blue-liner Cam Crotty took to Twitter today to announce his commitment to BU. The 17-year-old is projected to join the Terriers next season. Crotty, who is eligible for next year’s NHL draft, is a 6-foot-1, 172 pound defenseman currently with the Brockville Braves of the CCHL. He has one goal in seven games this season after recording 18 points in 57 games with the Braves last year, indicating his knack of contributing on the offensive end. The Terriers have been extremely busy as of late adding recruits for the next couple of years, as they have picked up four commitments in less than a month. Defenseman Kasper Kotkansalo and forward Shane Bowers will likely join BU for the 2017-18 season, while 14-year-old Dylan Peterson is projected to arrive at Commonwealth Avenue in 2020. Here are some more tweets regarding Crotty. 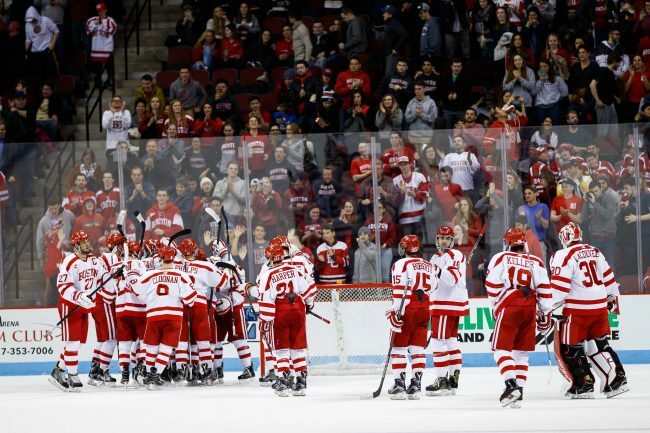 The 2016-17 Boston University men’s hockey season is in full swing, but that doesn’t mean head coach David Quinn has dialed back his recruiting efforts. As announced via Twitter on Wednesday morning, Dylan Peterson, a forward projected for the Class of 2020, has committed to the Terriers. The 14-year-old hails from Russell, Ontario, and currently skates for the Canadian International Hockey Academy. An assistant captain for their Bantam AAA team, Peterson has 15 points in nine games. Prior to playing for the Ontario-based school, Peterson put up 53 points in 33 games for two different OEMBHL teams – the Ottawa Jr. 67s and the Eastern Ontario Wild. A scouting reports also suggests that Peterson will high-end skill to Agganis Arena. When Peterson arrives on campus, he’ll join a trend of Quinn recruiting Canadian-based forwards. The 2014-15 class featured A.J. Greer, then the youngest player in the NCAA. This year’s Terriers also features Gabriel Chabot, a 20-year-old winger from Quebec City.